Looking for a rental house close to IU? We own six rental houses just east of the Indiana University campus. All are in the Green Acres neighborhood. We love our houses and try very hard to take care of them and keep them nice. We also try really hard to be the best landlords around! We live here in Bloomington (just a mile east of our rentals), and are usually available not only to fix anything that needs fixing, but also to answer questions and help out our tenants whenever possible. If you have any questions, call Paul or Jeannette at 812-720-3011. We'd be happy to show you the house or houses you're interested in. Or email paul@realtysearch.com. 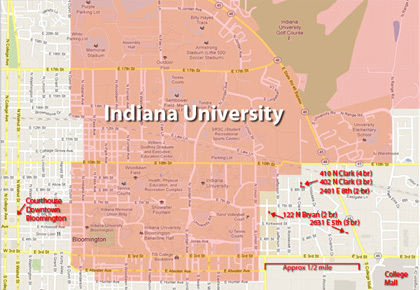 All of our houses are located within a half-mile of the IU campus, and close to both IU and city bus lines. 410 N. Clark St, Bloomington, Indiana 47408 | $495/month/bedroom. 402 N. Clark St, Bloomington, Indiana 47408 | $1440/mo. We do allow most pets in all of our houses -- but we require an additional $15/month per pet, and we reserve the right to check on the condition of the house and yard to be sure the pet isn't causing any real damage! Most of our houses have hardwood floors with no carpet, but tenants are free to bring in rugs if they want. 1502 E. University St., 711 W. Dodds St., 713 W. Dodds St., and 715 W. Dodds St..
Our company, BCS Advertising, designs, updates, and hosts websites for individuals, businesses and for IU departments. We also design brochures and print materials and ads.